POLL: Do you support Trump's pick for secretary of state? 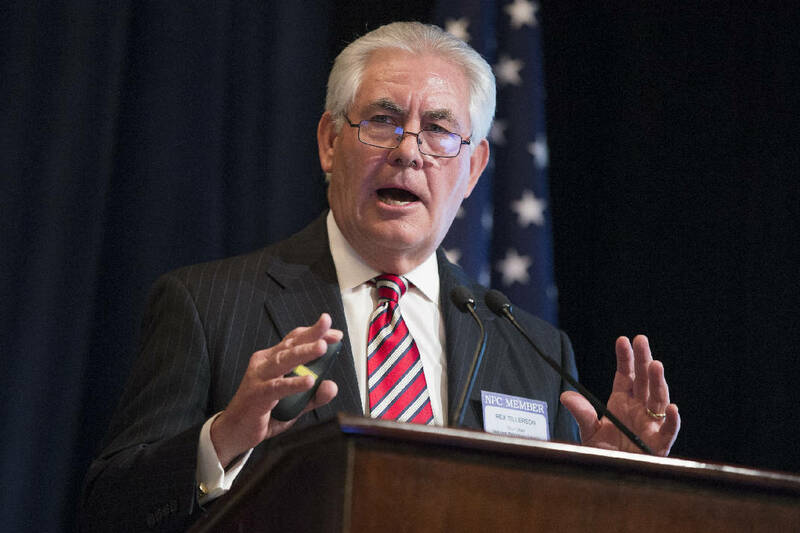 NEW YORK (AP) — President-elect Donald Trump announced Tuesday he has picked ExxonMobil CEO Rex Tillerson to be secretary of state, calling him "among the most accomplished business leaders and international deal makers in the world." "Rex Tillerson's career is the embodiment of the American dream. Through hard work, dedication and smart deal making, Rex rose through the ranks to become CEO of ExxonMobil, one of the world's largest and most respected companies," the billionaire real estate mogul said in a pre-dawn news release from Trump Tower in New York. Tillerson "knows how to manage a global enterprise, which is crucial to running a successful State Department," Trump said. In a tweet, Trump added that Tillerson "has vast experience at dealing successfully with all types of foreign governments." In an accompanying statement, Tillerson said he was "honored" by his selection and shares Trump's "vision for restoring the credibility of the United States' foreign relations and advancing our country's national security." But Tillerson has close ties to Russia and President Vladimir Putin, which is certain to draw scrutiny and fuel a potential Senate confirmation fight. Leading Republicans have already expressed anxieties as they contend with intelligence assessments saying Russia interfered with the U.S. presidential election to help Trump. Sen. Bob Corker, chairman of the Senate Foreign Relations Committee that will hold confirmation hearings in January, called Tillerson "a very impressive individual" with "an extraordinary working knowledge of the world." Corker, who had been considered for the secretary of state job, said Trump called him Monday to inform him of the pick. "I very much appreciated President-elect Trump calling me last night to let me know that he would be nominating Rex Tillerson for Secretary of State," Corker, said. "Mr. Tillerson is a very impressive individual and has an extraordinary working knowledge of the world. I congratulate him on his nomination and look forward to meeting with him and chairing his confirmation hearing." "On a personal note, it has been an honor to be considered for Secretary of State," Corker added. "I thoroughly enjoyed spending time with the President-elect and his team throughout this process and appreciate the deliberate manner in which he arrived at this decision. I look forward to working with him to move our country forward." Reince Priebus, Trump's incoming chief of staff, said Tuesday that Tillerson was chosen because he is "a diplomat that happens to be able to drill oil." Tillerson has "had to maintain relationships across the world in many places that aren't the easiest places to have relationships," Priebus said on MSNBC. "The good Lord didn't put oil in all freedom-loving democracies across the world and yet Rex Tillerson was able to make this work. Donald Trump and Rex Tillerson, they hit it off and they have a similar vision of how to get things done," Priebus said. Trump has made it clear he sees Tillerson's deep relations with Moscow as a selling point. As ExxonMobil's head, Tillerson maintained close ties with Russia and was awarded by President Vladimir Putin with the Order of Friendship in 2013, an honor for a foreign citizen. For weeks, Trump has teased out the secretary of state decision process publicly, often exposing rifts in his organization. Besides Corker, he also considered former Massachusetts Gov. Mitt Romney, a one-time vocal Trump critic. Romney wrote on Facebook Monday that it "was an honor to have been considered" for the job. Trump's unconventional Cabinet vetting procedures are in keeping with his presidential style thus far, unconcerned with tradition or business as usual. In recent weeks, he's attacked CIA intelligence, spoken to the leader of Taiwan — irritating China — and has continued his late-night Twitter tirades. Beijing is looking forward to working with the new secretary of state "to push forward greater progress of the bilateral relationship on a new starting point," China's foreign ministry spokesman, Geng Shuang, said Tuesday. In Washington, a congressional investigation is in the works over a CIA assessment that Russia interfered in the November election on his behalf, a conclusion Trump has called "ridiculous." The issue is raising red flags among lawmakers concerned about the sanctity of the U.S. voting system and potentially straining relations at the start of Trump's administration. On Twitter Monday, Trump pushed back, saying: "Can you imagine if the election results were the opposite and WE tried to play the Russia/CIA card. It would be called conspiracy theory!" Putin, meanwhile, said he was ready to meet with Trump "at any moment." In the transcript of his interview with journalists which was released Tuesday in Moscow, Putin said "it's widely known that the elected president of the United States has publicly called for the normalization of the Russian-American relationship. We cannot but support this." Putin added that he thought a meeting with Trump would be more likely after Trump's January inauguration. "We understand it will not be a simple task considering the extent of degradation of the Russian-American relationship," he said. "But we are prepared to do our bit." If confirmed, Tillerson would face immediate challenges in Syria, where a civil war rages on, and in China, given Trump's recent suggestions that he could take a more aggressive approach to dealing with Beijing. A native of Wichita Falls, Texas, Tillerson came to ExxonMobil Corp. as a production engineer straight out of the University of Texas at Austin in 1975 and never left. Groomed for an executive position, Tillerson came up in the rough-and-tumble world of oil production, holding posts in the company's central United States, Yemen and Russian operations. Early in the company's efforts to gain access to the Russian market, Tillerson cut a deal with state-owned Rosneft. The neglected post-Soviet company didn't have a tremendous amount to offer, but Exxon partnered with it "to be on the same side of the table," Tillerson said, according to "Private Empire," an investigative history of Exxon by Steve Coll.